Mary E. Hunt: We are delighted to have all of you with us for what I anticipate will be an hour of stimulating and helpful conversation with our two guests. Like all of WATER’s efforts, our purpose is not simply theoretical. Rather, we are focused on changing the cultural and intellectual assumptions that ground discrimination, exclusion, and destruction. As we engage in this important topic I remind us of our commitments so as to frame our conversation not as a purely cerebral exercise but one that I know will contribute to world peace. Today’s topic is familiar to WATER colleagues. A year ago, November 2, 2016, we had the pleasure of talking with the Rev. Dr. Renate Rose who spoke on “Feminist Efforts to Overcome the Genocidal Mentality of Nuclear Weapons.” In her talk, she stressed the evolution of consciousness necessary to deal with contemporary challenges to global well being. Today’s conversation comes from our interest in an important book, Women, Religion and Peacebuilding: Illuminating the Unseen edited by our speakers Katherine Marshall and Susan Hayward. When we read and blurbed this book for our Resources section I wrote: “The book contains the stories of women from a wide range of religious traditions, countries, and conflicts. The stories are sadly similar yet consistently powerful. Despite barriers to their official leadership, many women bring spirituality-grounded commitments to effective negotiations and peace efforts. This collection sparks two unspoken questions for considered discussion: how patriarchal religious practices can be barriers to peace, and just how much more peaceful the world could be if feminist religious energies were valued and implemented. We can but hope.” Today we act on that hope by welcoming the editors to our WATERtalk. Katherine Marshall is a senior fellow at Georgetown University’s Berkley Center for Religion, Peace, and World Affairs and Professor of the Practice of Development, Religion, and Conflict at the Walsh School of Foreign Service. She heads the World Faiths Development Dialogue (WFDD), a non-governmental organization that bridges gulfs separating worlds of development, humanitarian affairs, and religion. She spent some 35 years at the World Bank in varied operational positions, working on Africa, Latin America, and East Asia. Her other books include Global Institutions of Religion: Ancient Movers, Modern Shakers (Routledge, 2013). We have not met, Katherine, but I am delighted to make your acquaintance in this forum. Welcome. Susan Hayward serves as the Director of Religion and Inclusive Societies at the United States Institute of Peace (USIP) in Washington, DC. Prior to joining USIP, she worked on human rights and refugee policy. 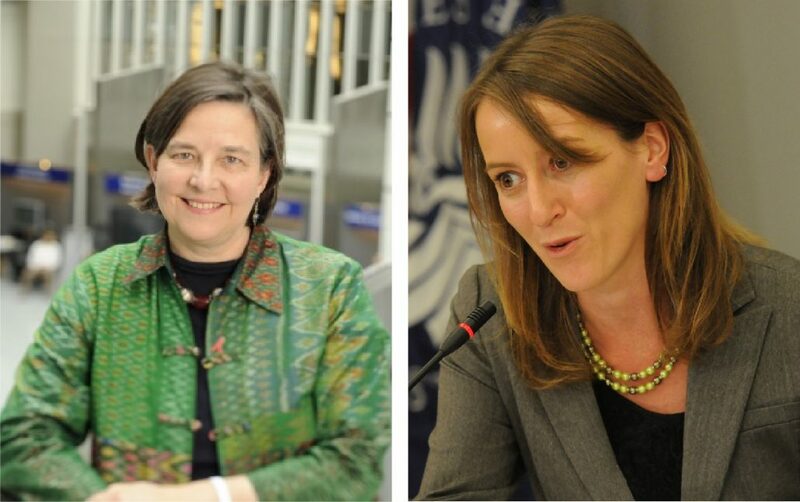 At USIP, Hayward specializes in the role of religious factors and actors in violence and peacebuilding, with a particular emphasis on diversity and interfaith relations, gender dynamics, and political Buddhism. Her fieldwork has focused in Myanmar, Sri Lanka, Iraq, and Colombia. Hayward is currently pursuing a doctorate in Religious Pluralism at Georgetown University. An ordained minister in the United Church of Christ, Hayward is published widely, serves on the International Selection Committee for the Niwano Peace Prize, and on the U.S. State Department’s Foreign Policy Working Group on religious engagement. We met through our common alma mater, Harvard Divinity School, where she has been in the leadership of the Alum Council. I look forward to seeing more of you in DC, Susan. Susan Hayward: Thank you, Mary. I’ll talk a little about the background on how this project came about, Katherine will share some of the major findings, and then I’ll talk about some of the theological themes that came up. This project came out of personal experience. I studied religion, violence, and peacebuilding in graduate school, but never really focused on gender dynamics. I arrived at USIP to work on the religion program, and I was the first woman. Very quickly I became conscious of the gendered consequences of USIP’s peacebuilding work, as well as the wider world of religious peacebuilding. In particular, I asked, how are we defining how religion is shaped? How are behaviors vis a vis violence, peace, and justice being influenced and shaped within religious communities? There seemed to be an assumption that it was formal clerical authorities that was determinative of the religious dimensions of conflict or peace. But as we know, religion is shaped by multiple factors. Individual attitudes and behaviors don’t always fall in line with clerical authorities. Second, when we’re shaping religious peacebuilding agendas and we focus on male clerics, whose peace are we really advocating for? Are they able to bring the priorities and concerns of women and youth to the table, for example? Finally, because so much of the normative work of religious peacebuilding, or the work that gets visibility and funding, focused on male clerics and their role, how were we reinforcing gender inequality? I was operating with a foot in two different worlds: religious peacebuilding and women’s peacebuilding. Some of the women in the latter group felt that more religious engagement would be bad for women because so much of the focus was on male clerics. I was sympathetic to their concerns. But I also knew that there were a lot of religious women who were very involved in the work of religious peacebuilding on the ground. They were transforming drivers of violence but also the gendered norms that keep women oppressed. So I was concerned that in the women, peace, and security world, people who had negative views of religion were not able to see the ways in which religion empowered women and offered them new ways to engage. Religious women leaders were falling through the cracks and not being engaged in the world of religious peacebuilding, as well as the world of women, peace, and security. This was the motivation for bringing together scholars, practitioners, and policymakers from different contexts to explore these questions. Just one quick definition: when we talk about women’s religious leadership, we are taking a very broad approach. We move beyond clerical authority, even though we recognize that women do hold clerical leadership within some traditions. But we also look at the ways in which religious actors operate outside clerical authority: e.g. scholarship, media, activism, etc. Katherine Marshall: I have come at these issues very much as a practitioner. I’m quite new to the academic world. The main train of thought I have in addressing an issue is: What are the implications? What can we learn from these findings? How can these lessons benefit peacebuilding? There are seven points that we’ve distilled from these discussions. The first, which I doubt will come as a surprise, is about the role of religion in global affairs, including peacebuilding, development, economic and environmental management, etc., trying to ask the question: What’s religion got to do with it? Even asking this question in a thoughtful way is still an uphill battle. Issues of women in religion are still more problematic. Looking at the topic of religion and development, the problem of gender always comes up. So in a sense you have a Bermuda Triangle where you’re fighting first to get religion looked at, then you have women and peacemaking, and then you have women’s religious peacemaking. You’re going upstream in many discussions in focusing on this nexus of issues. Second, the word “invisibility” kept coming up. The work that remarkable and courageous women are doing is not recognized nor being celebrated within either religious or nonreligious communities. They don’t get resources, they’re not serving as role models for the next generation. But sometimes we heard people argue for strategic invisibility. For example, some said that by not being expected to be “leaders”, women are able to achieve and lead more. Third, the definition of peacebuilding and conflict management was different when we asked women. It was much broader. Whereas for some peacemaking implies direct negotiations, many of the women we spoke to understood peace not only as prevention, but also as a community issue: microfinance, working against domestic violence, addressing community and cultural concerns, etc. Some women directly involved in core peace issues didn’t even see themselves as peacemakers. Fourth, there’s a tension between people who define themselves as feminist and people who are primarily motivated by religion. As Susan mentioned, feminists can be very uneasy about religion, especially religious women. And vice versa–some religious women are skeptical of feminism. A task is to try to build greater understanding between them. [Five] Another tendency is that in times of conflict women often take on new roles and are respected and honored for those roles. People look to them to take on more formal religious roles but when the conflict is over there’s a tendency to expect them to go back to the kitchen. [Six] As we went through this exercise one thing that kept coming up was that you cannot essentialize women. You’d have a discussion about the skills of women for example inbridging different communities through empathy and being good listeners, but then someone would say, “but you can’t essentialize women.” And we agree. Women bring very different qualities, both good and bad. But there are two or three issues that we thought were important. First, women have different agendas which may focus more on families, children, health services, education, water, than do men. When you bring women in, the agenda tends to be different. There are also well documented differences in style of operation, which can mean more inclusiveness. We also highlighted some of the leadership qualities that women bring to the work. While not essentializing, we don’t think we should shy away from some of the gifts that women bring. The seventh point that came up was the tendency not to address, to skirt or downplay, issues of violence against women in all too many settings. Having women at the table increases the likelihood that this will have a much higher priority. So these are clearly broad themes emerging from our research, and there are many more. This is just the beginning of a much deeper exploration. There’s a need to take these themes and build them into alliances and networks. SH: We’re happy to elaborate on any particular examples in our discussion. There are a couple points I want to make about theological concerns and about how these women navigate patriarchal religious barriers. With respect to the first question, I think this is where the issue of invisibility is so fascinating and critical. Particularly Catholic and Buddhist nuns say that their invisibility allows them to do things that clerical authority might not support. On the question of what feminist theology itself can bring to peace, within our book there is a chapter by Andrea Branch, who points to the work of Monica Maher. They note how women in Honduras and Israel/Palestine, as well as other places, turn to their religious texts and traditions to look for role models who have led peace efforts historically from their traditions. As they uncover these stories of women leaders, this leads them to bring feminist considerations to theology – seeing how religious power plays out on gender norms and dynamics particularly with respect to hermeneutics in their tradition. This, in turn, makes them more conscious of power dynamics operating around them in conflict environments. They bring a feminist religious lens to bear on their conflict situations. They draw from their experiences as women and become better conflict analysts because they are able to understand multilayered forms of oppression and violence. For example, in Sri Lanka I work with a group called the Centre for Peacebuilding and Reconciliation. They developed a network of about 200 primarily male clergy from around the island who were involved in peacebuilding. Their method of training and education on peace is very focused on power dynamics. A year ago they decided to create a women clergy network. They brought the same curriculum they had brought to the male clergy but the women understood it faster, noted CPBR, because they were able to translate their own experiences of gender oppression to the relationship between majority/minority communities in Sri Lanka. MEH: Thanks to our speakers for this terrific overview of their work. It was great to hear the name Monica Maher mentioned in your presentation. She was the first WATER intern and her work in Honduras has been incredibly important. She was connected with Berta Cáceres, who is an example of women doing peacebuilding and working for environmental justice and indigenous rights. Berta was murdered in her own home in 2016, so thanks for lifting up that extended network. Comment: I very much appreciated what you’ve been saying about not essentializing women’s gifts and pointing out the enormous diversity of experiences that women have. With regards to the invisibility, I think it’s also a question of equality. I think not much work has been done in terms of looking at how our capitalist system neglects women or corrupts them which does not lead to general equality. For Christians, the religious possibility is so clear in communion. You can interpret the bread of equality and cup of solidarity. When I think of violence and war, I think there is no more violent weapon in the world than nuclear weapons. If we have nuclear war, all of this work of women will be for nothing. That has to do with the capitalist and military industrial complex that we live in. Maybe women should really look at how the male dominance in the military industrial corporations has led to where we are now in regards to nuclear weapons and the militarization of our society. KM: Some of our interviews for the book touched on broader issues of the world order. One person that comes to mind is Scilla Ellworthy who has done amazing work at coming to terms with the militarism of the world. It is certainly an area where we need more discussion which would really confront the different silos in which so many of these decisions are made. Clearly, our attitudes towards the general invisibility of women echoes very much what you are saying. If you had equal voices within the community, strategic invisibility would not be necessary. For example, because women’s work is rarely recognized, they don’t get financial resources, they’re not recognized in prizes, and more. But we wanted also to listen to the voices that focused on the practicality of the cloak of invisibility whereby through not drawing attention to your identity and prerogatives you may be able to achieve far more than if you’re in a position of visible authority. People who are not part of power structures may well have more insight into them. The fact that they are not seen and recognized gives them the possibility to innovate and find ways outside of conventional thinking. We had to appreciate that invisibility might be something good. It opens lines of thinking that are helpful and informative. SH: The only other thing I would add is that, just as women bring a broader understanding of what peace is, that comes from a broader understanding of violence. Not just violence of overt warfare, but also violence that is a part of the domestic environment, a part of institutions and economic systems. There is a relationship between domestic violence and overt violence. The violence of war is oftentimes absorbed into the home when the war comes to a formal end. What women are able to bring into the peacebuilding agenda often takes into account how multiple forms of violence mutually drive one another. The peace agreements that are forged out of this are much more sustainable. Q: Susan, you’re an ordained UCC minister, I wondered how you found the various Protestant churches supporting or not supporting your research? What has your experience been as a woman working within the various denominations? SH: Well, I should be clear that most of the work has been focused overseas. The USIP was created by the US government but has a strict mandate to focus its efforts overseas. We can’t focus on violence here but only tell others overseas what to do, which is very American! As a result, I’m often not encountering a lot of United Church of Christ folks because they don’t have as much of an international presence as other denominations. I think you’ll find a huge range of responses to this very question. Some questions that come up are: What will be the consequences of this for our religious communities? Is this going to end up pushing an agenda for women’s ordination? There is some discomfort from some authorities who think that asking these questions could lead to processes of reform within their own traditions. But I wouldn’t say that we encountered active resistance overseas trying to support women’s peacebuilding work. However, there are subtle ways in which it’s difficult to get women involved in meaningful ways. For example, I work with a lot of Buddhist communities, and Buddhist nuns give a lot of reverence to Buddhist monks. So sometimes when they’re in the room together the women don’t speak up but refer to the monks to answer the questions. So these are questions of facilitation and process that need to be addressed. KM: You also have the element of tensions among and within religious traditions. Whether it’s Protestant v. Catholic, Sunni v. Shia, etc., you experience tensions between different religious groups as well as tension more broadly between religious and non-religious actors. One of the main reasons why secular institutions like the UN are uneasy about the idea of engaging with religious figures is related to gender equality. The fact that you often have all male religious groups who are the spokespeople for religious traditions upsets people within secular organizations and can lead them to dismiss religious dimensions altogether as a positive force. MMany religious communities view themselves as being on the forefront of women’s interests, but the view from the other side is very different. So this is a divide that needs to be bridged. One of the ways to approach this divide is to address collaboratively practical issues like child marriage, domestic violence, and views on masculinity. SH: I also want to say that you find very different responses across the spectrum. One of the reasons I pursued ordination, aside from feeling a call to ministry, is that I see my work as very connected to the ministerial roles of pastoral care. I also knew that having the title of Reverend might give me a little bit more authority at the table. It could potentially encourage people to listen to what I have to say. In practice, that hasn’t always born out. For example, in Sri Lanka you don’t have formal women’s religious authority there. Tackling the question of ordination was a challenge within this. But I think that giving women access to high level religious education gives them the ability to better shape religious institutions. A big recommendation that came out of our study was to gain support for women’s religious education worldwide. MEH: I want to bring this up to date with the U.S. President is in China. I wonder if you think that he or any other major players in that arena know about the women peacemakers who crossed the demilitarized zone in May of 2015. They’ve been trying to raise global awareness about peace in Korea. They’re promoting women’s leadership and peacebuilding on the peninsula and building capacity and partnership. I wonder if invisibility is really the right word, or if this is simply a media question? Is what they’re doing not taken seriously simply because they’re women? Do you see them as a paradigm of what you’re pushing for? SH: I don’t know if I can add too much eloquence to what you’ve already said. In short, I don’t think President Trump or his staff are aware of what is actually happening on the ground. And yes, the invisibility is also a media problem–what draws the attention of media and international peacemakers. Very rarely does women’s work draw the attention of media. And media shapes what national and international leaders choose to respond to. KM: I would add to that that this is a broader problem within the peacebuilding field. Media attention very rarely goes to the grassroots efforts, even highly important substantive as well as symbolic efforts. Frustration at the media is a very common theme. SH: I think the media is much more drawn to stories of religious violence than it is to religious peacebuilding. That’s probably for a lot of different reasons, but I think some of this extends from the baggage of the Enlightenment and the view that religion is an irrational force that drives violence, not peace. They’re not necessarily looking for a story that displays religion as a force for relationship and peacebuilding. KM: Yes, and certainly they don’t focus on the women. MEH: Yes, and most women don’t count as religious because they don’t wear collars or vestments that make them markedly religious in the ways that the media portrays religious leaders. SH: Yes, that also speaks to the phenomenon that the religious aspect of women peacebuilder’s work is often downplayed. For example, Nobel Laureate Leymah Gbowee is a religious leader. She brought religious ritual, language, and institutional authority to bear on the peace process in Liberia. But you don’t often hear her presented in the field of women’s peacebuilding as a religious leader. There’s not a lot of attention to the specifically religious elements of her work that made her successful. MEH: That’s a very interesting reflection. It also points to the question of why so many secular peacebuilders look to religion with such antipathy, much of which I think is richly deserved. On the other hand, I think we often forget that religions are dynamic, changing activities and that women have to do so much work within our traditions to change them. Imagine if we didn’t have to do that work within our traditions, how much time and resources we could devote to peacebuilding. This also speaks to the invisibility question, which I’m not so sure I agree about entirely. But those are questions for another time. WATER thanks Katherine and Susan for their time and expertise. We look forward to continued collaboration. For further reading we recommend their book Women, Religion and Peacebuilding: Illuminating the Unseen.